Students in Professor Valerie Loew’s Horticulture class at Fullerton College in Orange County, CA. Photo courtesy of Fullerton College. When it comes to Controlled Environment Agriculture [CEA], Valerie Loew wants the U.S. to catch up with Europe and China before it’s too late. Loew began her horticultural career as a book smart botanist with a penchant for plant science, who founded her own 20-acre nursery business before teaching and working for the USDA. Observing the hydroponic imports coming into the United States and the limitations of the federal inspection process, Loew became an advocate for organic, locally produced food that used water and space as efficiently as possible. Her goal as a teacher and head of the hort department at Fullerton College is to provide her students with the practical knowledge and skills to work in a commercial greenhouse. 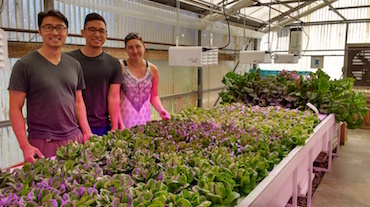 To facilitate their entry into the Controlled Environment Agriculture field, this fall Loew offered students a new hybrid course, HORT 255, on aquaponics and hydroponics. The course, which is co-taught with former NASA biotech expert Dr Roger Kern, provides Loew’s students with the hands on technical and scientific knowledge needed to manage a closed loop system. “Students get to learn a lot about the different nutrients, what’s limiting, what we can actually supplement and get to grow even faster and have products turn around even quicker,” says Loew. The class is funded by an innovation grant awarded to Loew for her S.T.E.M. based aquaponics curriculum. The course requires that students utilize technology to find solutions to lighting, climate, water and nutrient waste issues. Tight budgets and a 30-year-old greenhouse to work with ensure Loew’s class learns both the good and bad of a greenhouse based vocation. The greenhouse in question measures 30 x 40 feet and houses both the aquaponics and hydroponic equipment. There are two deep water culture tanks together with Mozambique tilapia on one side, and several deep water culture troughs for the hydroponics portion of the course occupy the remainder of the space in the greenhouse. Using S.T.E.M.-based research Loew and her students have fixed some of the light and humidity issues in the greenhouse. Now Loew wants to investigate ways to capture moisture in the air and feed it back into the system, and experiment with ways to reduce or recycle the drained waste. The 16 week class has proved very popular with 30 students in a class that should have maxed out at 25. Because of its popularity, the ‘fall semester only’ course will be offered again this coming spring and is expected to continue as a year-round addition to the department’s schedule. Because of the nature of the community college system in California, Loew’s course curriculum is available within the community college database. This means any professor in the system can access and replicate Loew’s work in their own department on their own campus. The community college is the bridge between the world of theory and the world of work. For Loew, focusing on the practical is the most logical way to help her students successfully transition between the two.